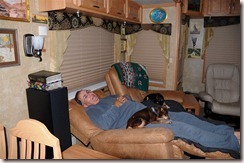 Thoughts and experiences of a Christian and conservative couple living full-time in an RV. Nothing seems to happen as it is planned. This month with blogging is just not happening. I had even posted something of a blog challenge idea, which I had fully intended to do this month, but it looks like I’m not even going to get that done. Oh, well. No one else seems up to that challenge either. We have been having issues with our refrigerator, so that takes some of my time. We had to make some trips to different stores to check the sizes of 2 different Samsung refrigerators. One was an 18 cubic foot model and the other was 20 cubic feet. 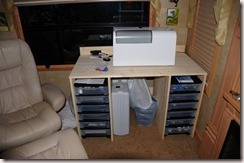 But, we’ve since decided to just fix the RV refrigerator we have now and try to save that money. After all, our extended warranty is supposed to cover repair or replacement of the RV one. This last Thursday, our youngest son and I went to a class put on by Baker Photo and Video out of Yukon, Oklahoma. We had gone in there a couple of weeks back and Eric had bought a Tamron 70-300mm zoom telephoto. While checking out the lens, Patricia the sales lady attached it to a used Nikon D300, which is the same model as my camera. Jo ended up buying the used D300 for Eric, so we decided to take this class on cameras together. When we saw the workbook for the class, I thought to myself that it was going to be a class on the basics of knowing about aperture, shutter speed, and ISO (which is the “film” speed, so to speak.) To my delight, we went into a lot of how to use the digital SLR cameras to best use those three elements of photography. I was also surprised to see that I already had been using those camera settings in the past. Shutter lag is that abominable long time between the time one presses the shutter button and the shutter actually operating. A long shutter lag prevents one from getting really good pictures of grandkids. Those little ones can really move fast. Right out of the range of the camera in a flash. I also learned that the built in flash on Nikon’s and Canon’s DSLR cameras have a tendency to be too “hot,” leading to some images looking like they are washed out. We were shown how to adjust our cameras’ flash compensation to adjust for that “hot” flash. Today was a different kind of day for me. 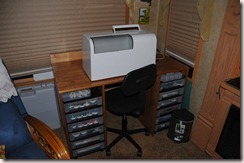 We got up this morning and Jo decided that it was time for her to put a finish on her sewing cabinet. In the past, we had just built it and then had Alicia and Slade at Rolling Retreats to get us the Suite Oak stain that is supposed to be what we have in the wood of our Mobile Suites. After helping her get the cabinet outside, she went to work applying the stain on all the surfaces. I did some online research and drank my morning coffee. We went to get some things at Lowes to help finish off the “look” of the cabinet. We bought some polyurethane finish and some wood trim to put along the top of the back of the cabinet, along the front of the top board of the cabinet, and along the front of the “legs” of the cabinet. We also bought some small nails to attach that wood trim. After getting that stuff, we went back and Jo stained the wood trim while I did “something” that I don’t even remember. Then I went to attach the stained trim to the edges of the boards and the very first nail caused the end of the trim to split. So, a trip was in order to go back to Lowes and get just a wee bit smaller nails. After helping to cut and then hold the trim while Jo nailed them in place, I went back inside the coach. 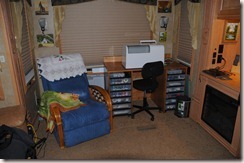 Somehow, I managed to get a nap while Jo was out “slaving in the heat” to finish the wood on the sewing cabinet. Man! What a SLUG I am. While the finished look appears to be a bit darker than the original finish of the interior wood, it still has a pretty good look. It is certainly a lot better than the unfinished look in the photo below. This next photo shows the finished product. Now, we just have to adjust to the smell of the newly finished cabinet until it gets better. If you’ve noticed pictures of our interior before, you may notice that the chair has changed. We had originally gotten rid of the original furniture for the coach and replaced the two recliners in the door slide with a love seat recliner and the couch in the back with a Euro-chair with ottoman and the sewing cabinet. Jo has given the Euro-chair and ottoman to her sister in Tulsa and has now put the recliner she had in her office at work in its place. 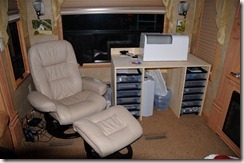 The recliner was originally purchase for her office because she used to have to “pull some all-nighters” while doing updates to the computer systems at work. Those updates cannot be done while other employees are there working, so the all-nighters were necessary. Sorry for the nonsense that I’ve been posting. I guess I need to get back to posting about vacations and showing more pictures of the places we’ve been. So, since I’ve had a nap and I took a late shower, it is likely that I will be up for a while. 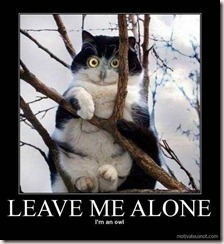 So, perhaps we need an image of a nocturnal creature? 16 Jun	This entry was published on June 16, 2012 at 11:18 pm and is filed under Uncategorized. Bookmark the permalink. Follow any comments here with the RSS feed for this post. Newer: How About a Prequel?